"Churnalism" - it's terrible stuff, isn't it? When so-called journalists pick up a press release or announcement from an organisation and simply reprocess it (perhaps even cutting and pasting chunks or the whole thing verbatim), adding nothing and doing no useful analysis or investigation before placing it in front of their readers. It's all too common, sadly, as any honest journalist would be forced to admit. A particularly comical example of the phenomenon took place yesterday, as the announcement of a new online churnalism-detector service was frantically churned. 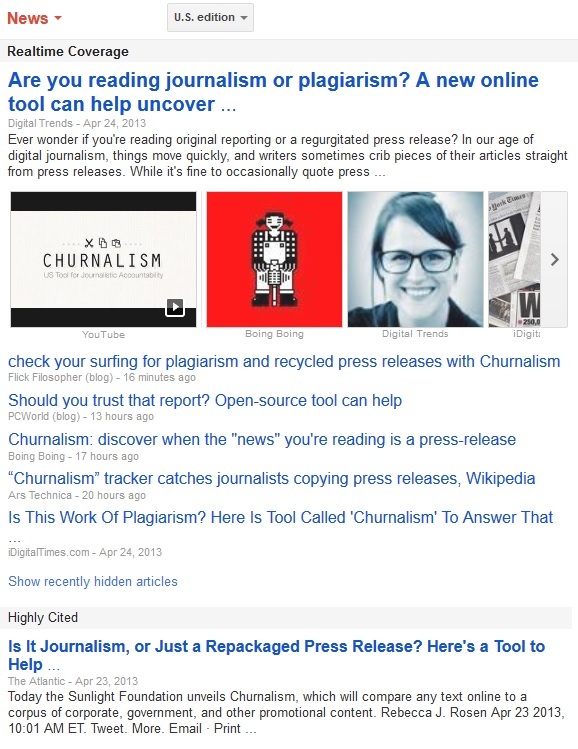 As we see from good old Google News (a service largely powered by churnalism), a lot of "journalists", in addition to being mainly churnalists, have no sense of irony either. Evidently for them, churnalism is something that other hacks do: what they do is proper journalism. The press release which is being uncritically churned here by many of the usual suspects is this one from the Sunlight Foundation, announcing its new US-centric churnalism scanner. A particularly pure example of the form is furnished by famed crusader for truth Cory Doctorow of the Guardian and Boing Boing, whose entire effort in the matter consists of publishing a tinned quote from a Sunlight Foundation mouthpiece and a link to the "detector". "I imagine every editor would want to run this [churnalism detector] on their stories before they publish!" bubbles Nicko Margolies. Obviously it's not lost on us here at the Reg that this very article in front of you is pretty much churn - but we do like to poke about a bit to see if there are any extra angles before we churn something. And in this case there is something. As it happens, the Sunlight Foundation churno-scanner is meant as a US version of a previously existing UK-based tool from Sunlight's partner, the Media Standards Trust of dear old Blighty, which offers a similar service aimed at the British media. And the Media Standards Trust, regular readers may remember, gave birth to - and remains closely linked to - the secretive pressure group Hacked Off, an alliance of wealthy and powerful individuals and celebrities, including Hugh Grant, which has successfully campaigned for state control of the media in Britain recently. There's still a further layer of irony here, if you like: not only did the journos churn the churnalism detector press release, but the churnalism detector winning such uncritical praise from journalists actually comes from an organisation which campaigns against press freedom.